They say that Balenciaga was fascinated with sleeves, and built his designs around them. As I get older, I realize just how important sleeves are -- middle age is not kind to women's upper arms, but I shall overcome, with the help of the gym. Still, I find that cap sleeves and puff sleeves compliment only certain women, and my shoulders are too big to pull them off. Heck, when I got married in 1987, I remember trying on one dress that was completely frou-frou (like most of the 80s) -- my mother sighed and looked at me lovingly. Her love for that dress was obvious. I, on the other hand, was quite certain that I looked like a linebacker. But I saw this dress today and am completely fascinated. I don't remember seeing leg 'o mutton sleeves in the 80s, and this is from 1982. Totally inspired by the 1890's, and seen for a very brief period in the late 60s, when they were more commonly seen as Juliet sleeves, but not in the 80s. 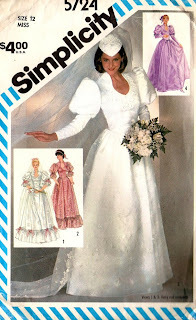 I think those leg 'o mutton sleeves make the dress in the photo look completely different than the illustrated ones. Combined with that deep neckline, and you've got the makings of some serious steampunk. Love it? Buy it here, from Deja Vu Patterns.